Here you will find a wide range of free Math Worksheets printable, which will help your child to learn to multiply numbers by multiples of 10 or 100. 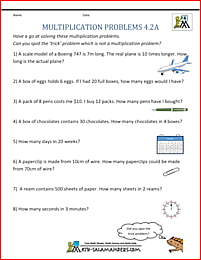 Here you will find our selection of Fourth Grade Multiplication Fact worksheets designed to help your child improve their ability to multiply a range of numbers by multiples of 10 and 100. 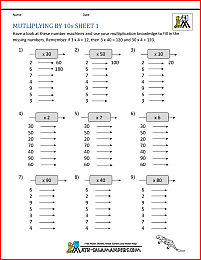 These worksheets build on and extend the multiplication learning that takes place in 3rd Grade. During 4th Grade, children use their knowledge of the multiplication table and place value to multiply numbers by 10s and 100s. The sheets are graded so that the easier ones are at the top. learn to use their multiplication tables to multiply by 10s and 100s. All the free 4th Grade Multiplication Fact sheets in this section follow the Elementary Math Benchmarks for Fourth Grade. 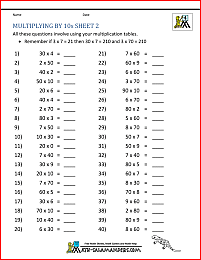 Here you will find a range of Free Printable 4th Grade Multiplication Worksheets. The following worksheets involve using the Fourth Grade Math skills of multiplying, and solving multiplication problems. multiply a two or three digit number by a two digit number.